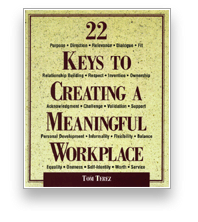 Tom Terez is a leader in the areas of employee engagement and Lean-powered improvement. These are often viewed as separate disciplines, with practitioners specializing in one or the other. Tom’s work combines the two, because engagement and improvement work best when they’re worked on together. Engagement: To get to the heart of engagement, Tom went to the source. He spent two years interviewing hundreds of people from all walks of life to get their input on what it takes to bring out the best in people at work. This led to his book (22 Keys to Creating a Meaningful Workplace), his early Web presence, and the launch of this practice in 2001. Lean Six Sigma: Tom was a principal architect of the Lean Six Sigma initiative in state government in Ohio. He served on the founding team beginning in 2011, and he went on to lead the LeanOhio Office. LeanOhio is a national leader, achieving significant results thanks to an active in-house network of Lean practitioners. Ideas: Over the past two decades, Tom has written hundreds of articles on engagement, change, teamwork, and potential. His e-letter, first published in 2003, has subscribers from 126 countries. Click here to read his most recent writings. Tools: Tom is the developer of the 5-Minute Assessment series, the Workplace Improvement Kit, the 22 Keys Workplace Assessment, the Working Smart Assessment, the Workplace Survival Guide, the Power With white paper, the Awesome & Awful Boss Hall of Fame, and the Difficult Dozen Help Zone. Many of the tools are available through the Resource Mountain™ tool set. Clients: Tom has led conference keynotes, workplace presentations, in-house workshops, breakthrough projects, and planning sessions for more than 100 client organizations. Click here for a comprehensive client list from past and present engagements. Included are private-sector companies (Boeing, Siemens, Fidelity, Sigma-Aldrich, Providence Health System, Jacobs Technology, Cleveland Clinic, Blue Cross, and many others), government agencies (FBI, DOE, IRS, SSA, ACF, 14 state governments, major counties and cities, etc. ), colleges and universities (University of South Carolina, Northern Arizona University, Duke University, University of Missouri, CUPA, and more), and associations (including SHRM, ASQ, ISPI, AASCIF, ASTD, and others). Personal: Tom is based in Columbus, Ohio. He and his wife, Angela, are the proud parents of two college-student daughters. For calm, Tom plays the piano. For fun and fitness, he runs trails. For kicks, he plays a vintage Hohner accordion. He wrote about it in an aptly titled post: Turning noise into music.